« How common is persistent ST elevation in inferior leads following STEMI ? What is the therapeutic approach for failed primary PCI ? Many would consider ” non availability of infrastructure and expertise ” is the major issue for primary PCI . But the real problem is much more than that .When an illusion of knowledge is created by constant bombardment of data , it is natural for human beings to believe whatever is told or printed in books and journals. We cardiologists are made to believe thrombolysis is a far . . . far inferior treatment than primary PCI in STEMI . It is not so in any stretch of imagination ! The fact that,there is no entity called ” Failed primary PCI ” in cardiology literature , would suggest how biased we are against thrombolysis. Every cardiology resident will recognise thrombolysis fails at least 40% of time .Yes , it is a fact , but the irony is , this is often used to convey a surrogate meaning , that is , primary PCI is near 100% successful ! How do you assess success of primary PCI ? Unlike elective PCI where the criteria is too liberal, we can not afford to adopt the same in an emergency PCI. Here the aim of the procedure is entirely different (Salvaging dying myocardium vs pain relief ). It’s still a mystery , while thrombolysis is vigorously assessed for it’s effectiveness primary PCI is rarely subjected to the same scrutiny . A check angiogram after the procedure , is all that is done . . . and every one leaves the cath lab happily. The effect of primary PCI on ST segment ECG resolution must be documented immediately after PCI. While , It is mandatory to take ECG after 60 -90 mts after thrombolysis , this sort of protocol is rarely followed after PCI. * Not withstanding the official lesion , hardware, related failure. If we encounter a severe triple vessel disease , with a bifurcation lesion and thrombus it’s a tough exercise as we are racing against time . No reflow is almost synonymous with failed primary PCI as successful correction of no reflow occur in minority. Not all TIMI 3 flow is converted into myocardial flow. If patient develops significant LV dysfunction following primary PCI it is a failed PCI. Finally if the cost of primary PCI exceeds the insurance limit it is economically a failed primary PCI as the patient has to spend double or triple the amount of sum insured .This stress has resulted in many recurrent coronary events . 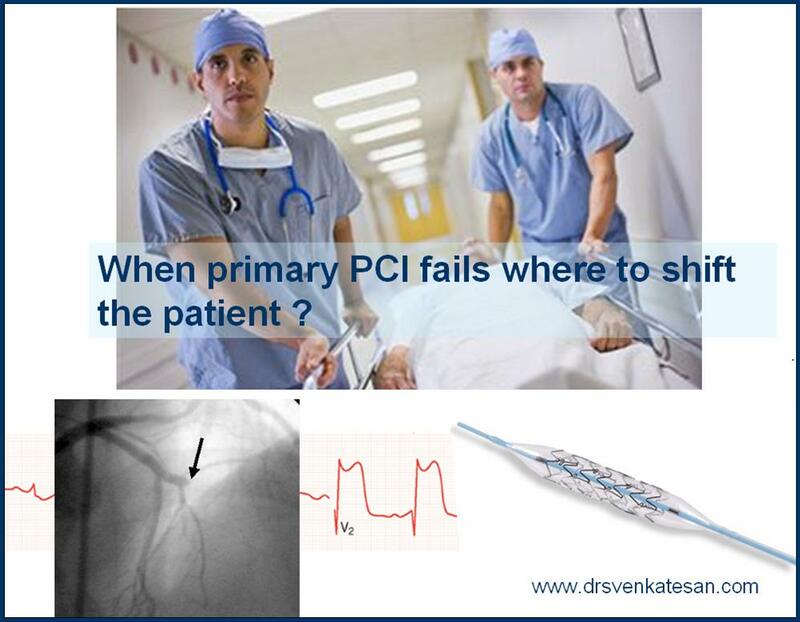 Why is it important to recognise failed primary PCI ? For failed thrombolysis we have a strategy . Unfortunately , even in this modern era we have no useful strategy for failed primary PCI . Handing over a patient to a surgeon in a such a situation is considered by many as a great rescue strategy but in real world it does no good in most of the patient. Doing an emergency CABG in a sinking patient with a battered coronary artery is no easy job /Many times it only rescues the cardiologists from the embarrassing situation of facing the relatives who ask for explanation. So , what can be done at best , in failed primary PCI ? CABG can be an option but still questionable ! Most times there is no other option except to fall back on the medical management. Intensive anticoagulation and one need to consider even a rescue thrombolytic treatment ! Some times we can only prey ! Failed primary PCI for a patient in cardiogenic shock with IABP support is near death sentence ! Remember , success of primary PCI is not in wheeling out a patient alive out of cath lab , with a TIMI 3 flow in the IRA , but in garnering significant myocardial salvage which should have an impact on intermediate and long term outcome . Do not ever think primary PCI is a sacred treatment modality in STEMI and the job of the cardiologists ends there. It is vested with lots of important complications – defined, undefined , recognised, unrecognised, reported, and unreported , concealed ,denied, poorly understood, etc etc. There are equally effective, less dangerous treatment modality available . Decision to do primary PCI must not be based only on the “affordability and availability” of cath lab and expertise !